Little River South Carolina is the oldest -- and one of the most unique -- towns along the greater Grand Strand. Little River is about 20 miles to the north of the hustle and bustle of Myrtle Beach, so residents and visitors alike share more peaceful days in this quaint fishing village. Yet Little River is just a short drive to all the Grand Strand's famous attractions, signature golf courses, unique variety shows, shopping outlets and world-class entertainment. And with two Las-Vegas-style casino gambling boats now docked in Little River, locals and tourists flock to the waterfront twice a day, every day, for world-class casino gambling excursions into international waters where gambling is legal. For those who love to play in the waterway instead of fish, there are jet ski rentals at the waterfront as well as dock space and pontoon boat rentals at Crickett Cove and Coquina Harbor marinas. It's no secret that property values and real estate in Little River are rapidly rising in value since almost every one who visits wants to move or have a second home here. There's a quality of life that residents cherish and visitors admire in our beautiful town on the north end of the Grand Strand. Webmaster's Note: As readers may or may not know, Little River is an historic fishing village hugging the Atlantic Intracoastal Waterway, unincorporated, in Horry County, South Carolina. In viewing online descriptions of Little River, most notably at Wikipedia, we've read definitions stating that Little River is merely a CDP, or zip code designation. Nothing could be further from the truth. Little River is the oldest settlement in Horry County, as well as one of the oldest villages in the state, and is mentioned by name in civil war records and other documents preserved from the 1700s, 1800s, and 1900s. In contrast, zip codes were implemented in 1963. The video at the top of this page highlights several pictoresque spots in our beautiful town of Little River. 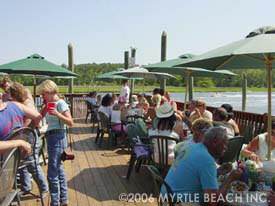 The photo above is taken on the deck of Crab Catchers Restaurant on Water Front Avenue, a locals' favorite spot for fresh fish, oysters, shrimp, or for watching the fisherman coming in with their catches and the gambling boats load and unload their passengers.